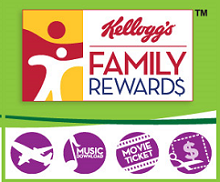 I have some brand new Kelloggs Family Rewards Codes for you all today! I am still saving mine for something cool, not sure what that will be yet but I have over 18,000 points in my account. :) Thanks to these free codes, I can earn some extra, bonus points. So, here are the new codes (expiration unknown)...enjoy!